An important element of the work of the Independent Expert is conducting country visits. Country visits require official invitations from the Governments concerned. Normally two country visits can be undertaken each year and the Independent Expert strives to conduct visits in all regions. Once an invitation has been made the Independent Expert travels to the country and meets with national authorities, including Minister and other senior government representatives with responsibilities related to minority issues, members of the judiciary and of legislative bodies; UN and other international agencies; civil society and non-governmental organizations. 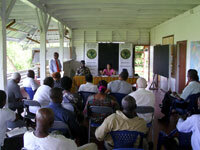 Meeting directly with minority communities and organizations is also a key element of the Independent Expert's visits. See Terms of Reference for Fact-Finding Missions by Special Procedures. The reports on these country visits, published annually as addenda to the Independent Expert’s report to the Human Rights Council, include an assessment of the relevant institutional and legal framework concerning the rights of minorities and the right to equality and non-discrimination in the countries visited, as well as a general description of the main issues affecting minorities. The reports include a number of conclusions and recommendations addressed to the Government in question and to other actors. (d) the guarantee of the right to effective participation of members of minorities in public life, especially with regard to decisions that affect them.